I’ve been to Paris many times. I’ve walked around the Louvre Palace and the Pyramid. I’ve imagined Robert Langdon discovering that the Grail is buried under La Pyramide Inversée. But I’ve never been inside the Louvre. I had the opportunity to visit the Louvre with someone who studied art history. Four hours and 37,228 steps later we were both out of energy. We went to the museum. 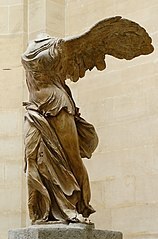 We saw lots of nice things like a picture of Mona Lisa and Winged Victory [Winged Victory of Samothrace]. There was a section for everything. My favorite sections where the Egyptian and Persian sections. The museum that we went to was okay. It’s also kind of cool because all the statues and things were real. There were mostly naked statues so that was boring. Then we left and had hamburgers for dinner and then we came home and started typing this. Louvre is a tricky word for me to type. Thanks for the catch!